Will Situps Give Me a Flat Stomach? Just doing situps isn't going to give you a flat stomach. Abdominal exercises don't reduce belly fat -- they just strengthen the muscles that are hidden underneath that layer of fat. To get a flat tummy, focus on reducing fat from your body as a whole, which will also reduce the fat from your belly, resulting in a flatter stomach. Abdominal-strengthening exercises can be part of your exercise routine as long as you don't count on them to reduce belly fat. 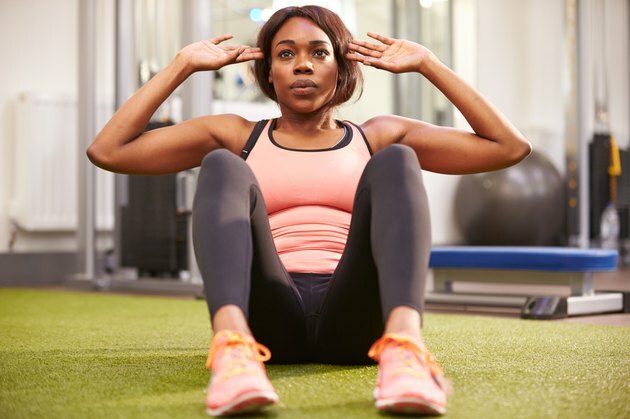 Your abs are part of your core, and a strong core can relieve lower-back pain, ease daily activities and improve your balance, posture, stability and athletic performance. In addition to situps, consider doing abdominal exercises on a stability ball, knee raises in a captain's chair apparatus and bicycle crunches. A study commissioned by the American Council on Exercise determined that these exercises most effectively target your abs. To get a flat stomach, cardiovascular exercise is essential to burn calories so you eliminate excess body fat. The U.S Department of Health and Human Services suggests doing 150 to 300 minutes of cardio per week. Whether you choose to go jogging, swimming or bicycling, you should be able to talk but not sing during the exercise. If you're cramped for time, split your workout into three sessions throughout the day, or boost your intensity to a vigorous pace during which you can't talk anymore. The latter allows you to cut your workout duration in half. Neglecting to do resistance training can result in muscle loss as you lose weight. Maintaining and increasing muscle tissue gives your metabolism a boost, because muscle uses up more energy to sustain itself. Perform strength-training exercises on at least two days of the week, as recommended by the U.S. DHHS. Do strengthening exercises that target your arms, legs, back, shoulders, chest and hips. This is also where your abdominal exercises fit in. Do eight to 12 repetitions of each exercise and aim to finish two or three sets. No matter how much you exercise, if your diet consists of junk food that's high in saturated and trans fats, sugar, cholesterol and salt, your belly fat won't budge. Get your nutrients from healthy fare, such as veggies, lean protein, low-fat dairy, fruits and whole grains. Replace unhealthy, high-calorie foods with low-calorie, healthier items. For instance, have air-popped popcorn instead of chips, or fruit instead of cookies. It only takes a 500-calorie daily deficit to lose 1 pound of fat per week, including that belly fat. The right combo of exercise and diet can do the trick. Truestar Health: Spot Reduction - Myth or Truth?